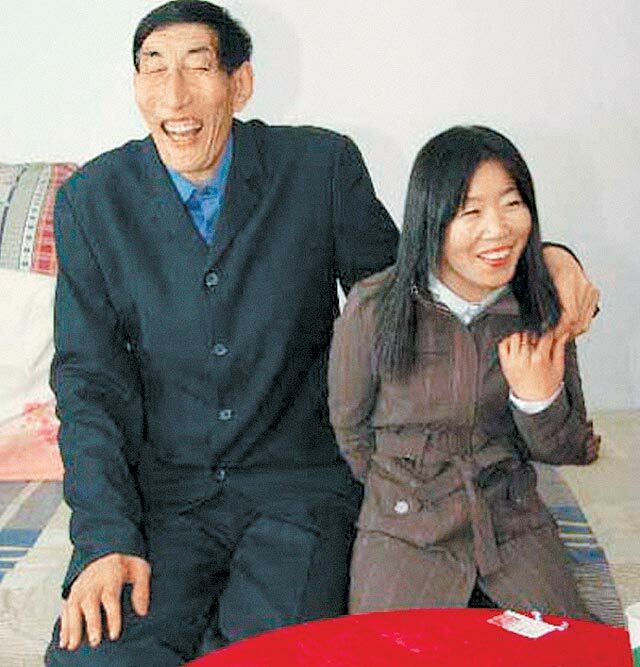 Bao Xishun, 55, from Mongolia, China is 7 foot 9 inches tall. He has never been married or even dated because of his extreme height. In February this year, he met a 28 year-old girl named Xia, and they fell in love. Just a couple of days ago, the couple were married. The soft spoken giant is from a family of herdsmen in Inner Mongolia. He has five normal-sized brothers and sisters. 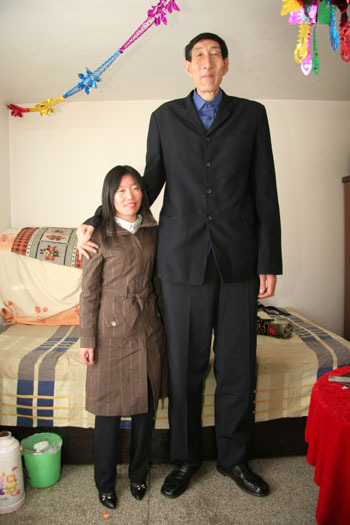 Earlier this year he was officially recognized by the Guinness Book of World Records as the tallest man on the planet. His height was normal until he was 15, then the extraordinary growth spurt started. By the ago of 20, he was already 6 foot 11. Bao now weighs 364 pounds, has legs that stretch for 4 foot 11 inches and his feet are each 1 foot 3 inches in length. 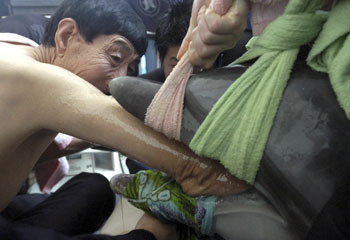 Last year, he used his 3 foot 6 inch long arm to save a dolphin by extracting a plastic object from its stomach. Edit: Just found another picture of the happily married couple.